On Friday, Nov. 9, members of the public and the Syracuse University community gathered to honor United States military veterans and victims of all wars during the University’s annual Veterans Day ceremony in Hendricks Chapel. 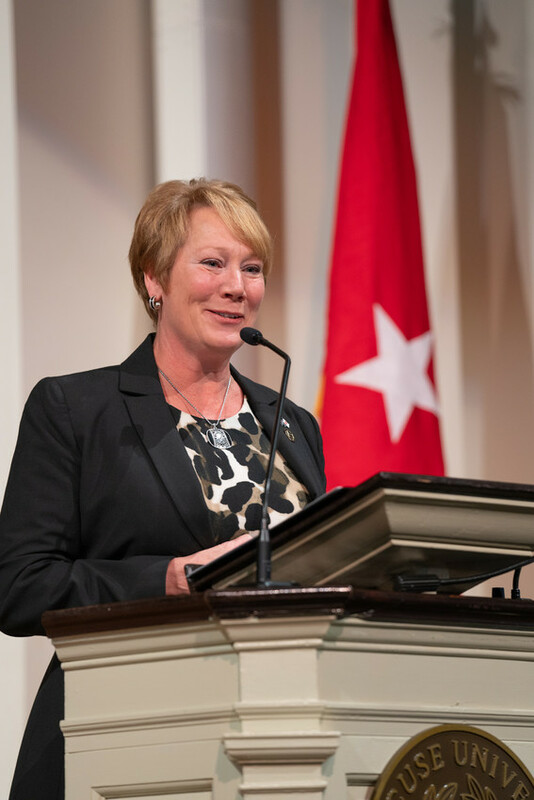 Retired U.S. Army Maj. Gen. Peggy Combs ’85, the highest-ranking female military officer to graduate from Syracuse University, gave the ceremony keynote. Combs, who originally commissioned into the U.S. Army in 1985 as a member of the Syracuse Army ROTC, retired from service Thursday, Nov. 8, in Hendricks Chapel—the same place she took her oath of service over 30 years ago. Derek Brainard, Navy veteran, MBA student in the Whitman School and adjunct professor at University College, led the ceremony as its emcee honoring all branches of service. The Rev. Brian Konkol, dean of Hendricks Chapel, gave the ceremony’s invocation and benediction. Music included performances from the Syracuse University Singers and the 198th Army Band out of Rochester, New York. In keeping with tradition, Chancellor Kent Syverud was presented with an American flag procured by U.S. Air Force Capt. Devon Conroy ’15 while serving in Afghanistan. The flag was flown during a combat mission over Afghanistan on Nov. 30, 2017. Following the ceremony the Syracuse University Army and Air Force ROTC color guard raised the U.S. flag outside Hendricks Chapel as Air Force ROTC Cadet Daniel Pesci and military photojournalism student and U.S. Marine Corps Serg. Lauren Gramley presented a wreath of flowers to Rob Rivera ’19, U.S. Army student veteran, and Jack Graver, U.S. Navy employee veteran. 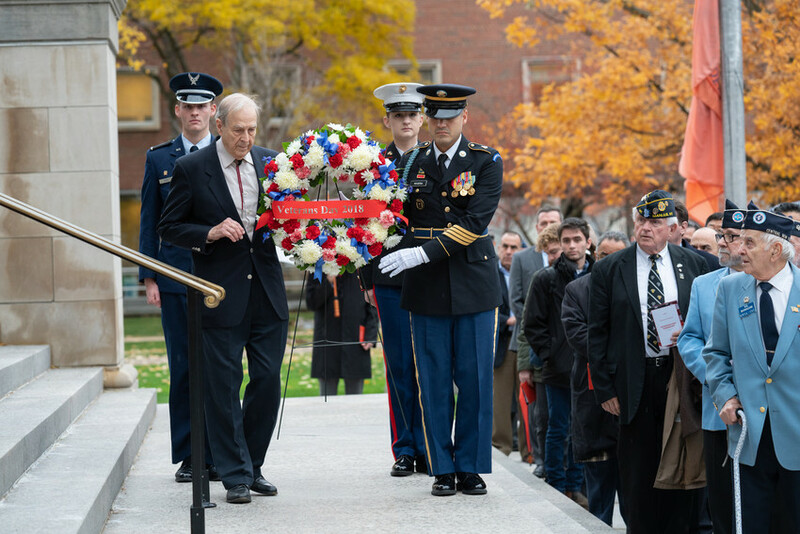 The exchange of the wreath between service members and veterans honors past Syracuse University veterans and signifies the transition and distinction between those who are currently serving and aspire to be called a veteran. The ceremony was part of Veterans Day events, including the ROTC fun run and walk Friday morning, the honoring of Major General Combs during Friday’s football game against Louisville Friday night and the clean-up of Oakwood Cemetery’s veteran’ section Saturday morning. Such events align with the University’s commitment to be the “best place for veterans,” a legacy that dates back to World War II when Chancellor William P. Tolley opened the University’s doors to military personnel returning from war and continues today with veteran and military-connected programs and resources, including the Office of Veteran and Military Affairs, the Office of Veteran Success and the Institute for Veterans and Military Families. The University was recently named the No. 1 private school on the Military Times’ annual Best for Vets rankings.